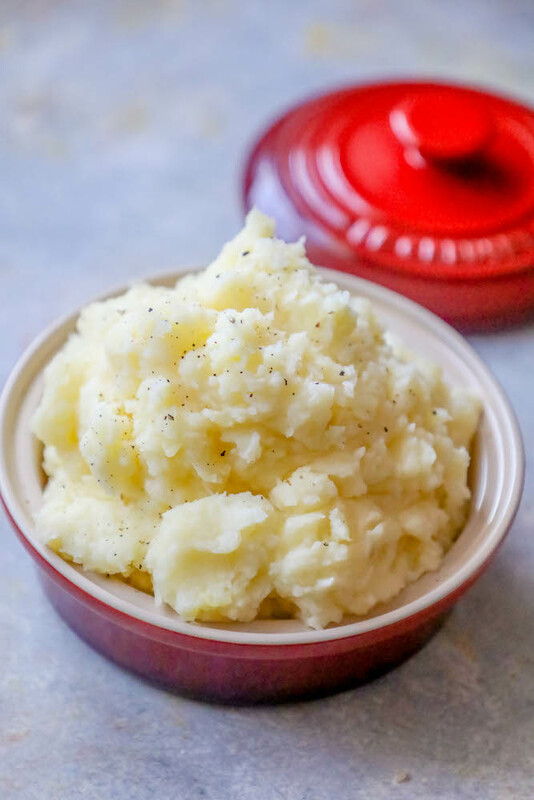 The best creamy mashed potatoes recipe – delicious light and fluffy creamy perfect mashed potatoes in under 30 minutes! 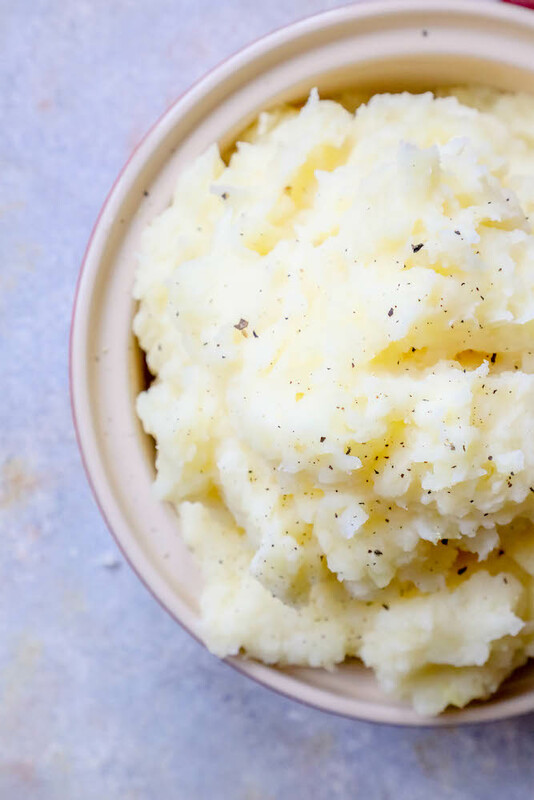 I can’t get my kids excited about my favorite mashed potatoes (which are full of lumps, potato skins, and tons of garlic) – but these creamy mashed potatoes are the perfect side dish for any picky eater because they are so delicious! These mashed potatoes are perfect in every way – light and airy – but also velvety smooth and totally creamy. A big serving of these mashed potatoes, drizzled in gravy, is practically heaven! I know your family will love these creamy mashed potatoes as much as ours does. 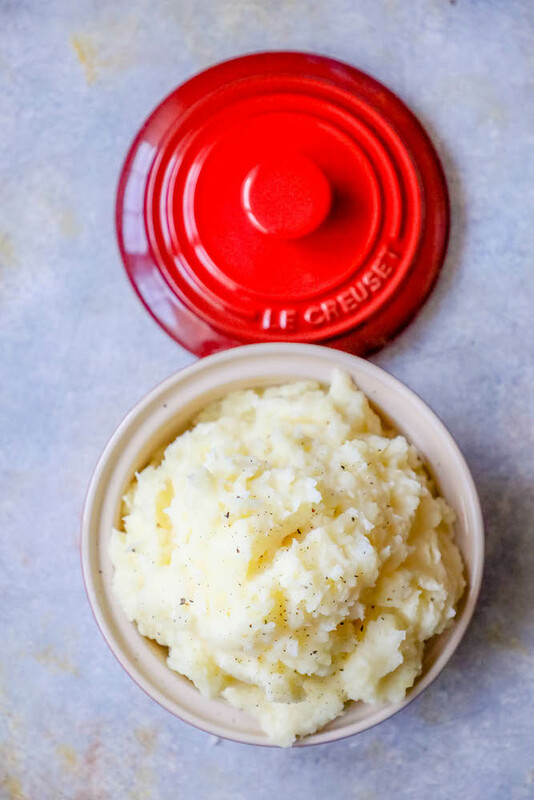 If you’d like to skip my tips and tricks to get perfect creamy mashed potatoes, please scroll to the bottom of the page where you will find the easy printable recipe above the comments section. I get a lot of questions and requests for similar recipes in my posts so I try to provide as much information as possible. 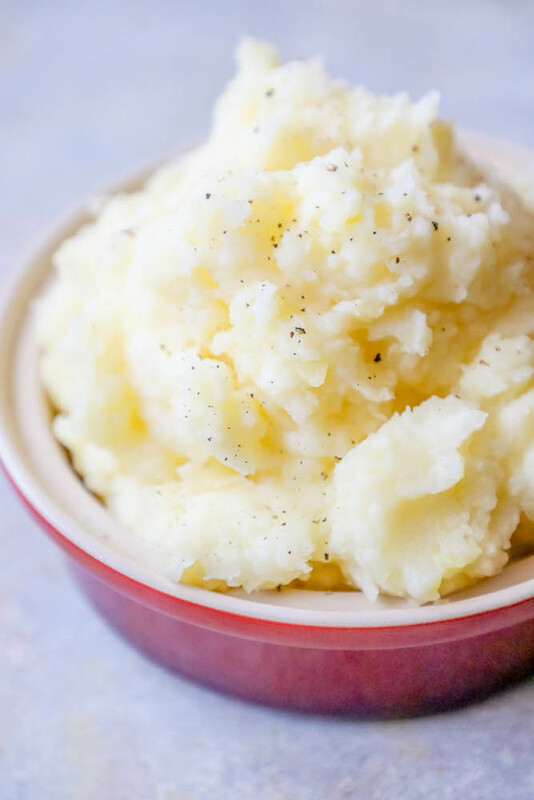 Perfect creamy mashed potatoes are incredibly simple and delicious with a couple of easy tips and tricks to be sure your potatoes come out perfectly! Follow these steps to ensure light, fluffy, smooth, and creamy mashed potatoes. -Peel and cut potatoes before boiling. This will reduce cook time significantly, ensuring potatoes don’t dry out. -Don’t rinse potatoes with cold water after cooking. -Mix hot potatoes with butter and sour cream immediately after draining water from stock pot to prevent potatoes from drying out. -If using garlic cloves instead of garlic powder, dice garlic finely and place in a pan with butter until butter is melted and garlic is fragrant. Add to hot, drained potatoes when ready in the large pot when adding sour cream and continue with recipe instructions. -For extra indulgent mashed potatoes, add up to ½ cup of cream cheese or parmesan cheese. -If you don’t have heavy cream, swap it for ¾ cup milk, preferably whole. If you don’t have a stand mixer, you can still make amazingly delicious, light, and airy mashed potatoes! -Using a hand potato masher or large slotted spoon, break potatoes down by pushing on them. -When potatoes are mashed, but aren’t entirely lump-free, slowly add in cream, sour cream, and butter while still mashing. -When creams and butters have been added, use a whisk and whip potatoes for 2-3 minutes, until fluffy, light, and lump-free! -If any lumps remain, press on them with the back of a fork to break them down, then re-whip with a whisk. If you’re looking for lump-free mashed potatoes, you’re in the right place! I’m sharing the best easy tips for perfect spuds without lumps! -Pick the right potatoes. For this recipe, I am a strong advocate of boiler potatoes, the smaller, light yellow potatoes that are a bit bigger than a fist and smaller than russet potatoes with a thin, smooth skin. -Use a handheld mixer or stand mixer for lightning quick super-smooth mashed potatoes – simply add ingredients and cooked potatoes in a large bowl or the bowl of your stand mixer with a whisk attachment, and blend to smooth. Using a stand or hand mixer will cut this recipes time down to around 20 minutes if potatoes are prepped properly before cooking. -Work quickly after draining water from potatoes as the potatoes will need moisture to keep it from drying out and firming up. 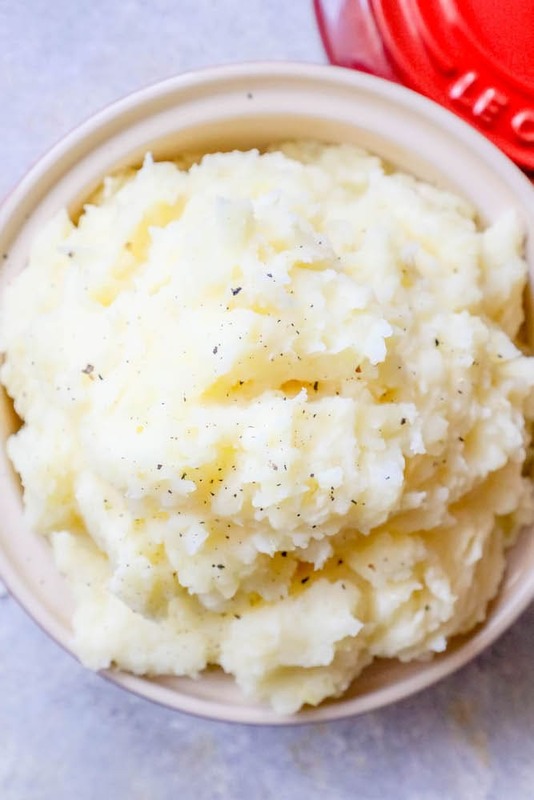 If you love the best creamy mashed potato recipe as much as I do, please leave it a five star review and help me share on facebook and pinterest! 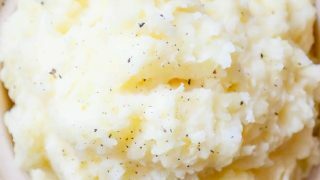 The best creamy mashed potatoes recipe - delicious light and fluffy creamy perfect mashed potatoes in under 30 minutes! Bring water and chicken stock to a boil in a large stock pot. When water and stock are boiling, add in prepped potatoes. Cook until potatoes are soft to the touch and crumble with light pressure, about 8-10 minutes. Drain potatoes and immediately transfer to large bowl or the bowl of a stand mixer. Add all other ingredients to bowl. Mix with a whisk, a hand mixer, or a stand mixer with a whisk attachment. Continue mixing until there are no lumps and potatoes are light, fluffy, and airy.